Sneak preview: Move over eggs and bacon! There’s a new breakfast in town! 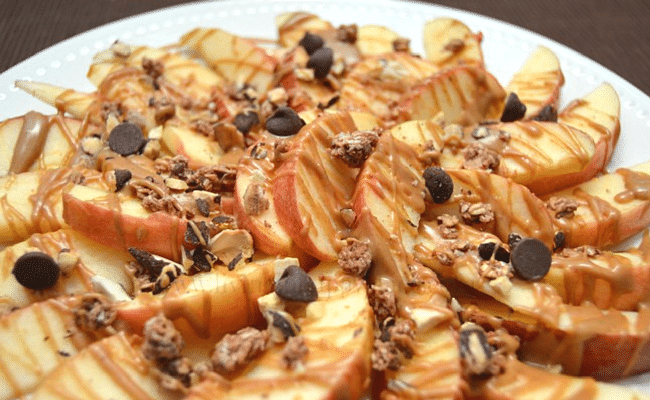 This Breakfast Apple Nachos recipe is a delicious healthy breakfast idea. Either you are a breakfast person or you’re not; there’s no in between. You either wake up and eat bacon and eggs or you live on coffee and a muffin until lunch. No matter what you crave in the morning, this easy and healthy apple breakfast recipe is a great way to start your busy morning. 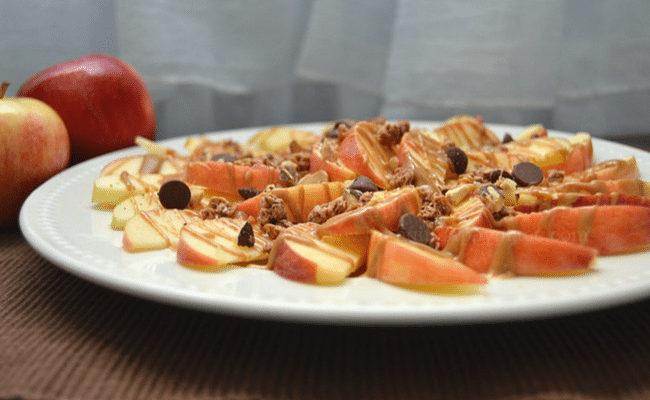 Chocolate, peanut butter, granola, and healthy apples make a delicious breakfast idea that’s way more fun than bacon and eggs! I’ve never been a big breakfast person. I just need something small to go with my coffee and keep my sugar up until lunch. Granola bars get old really fast and I’m always looking for other options. Finding something that is both healthy and filling can be a challenge. Mornings are hectic enough so having an easy “go-to” breakfast saves time and sanity! 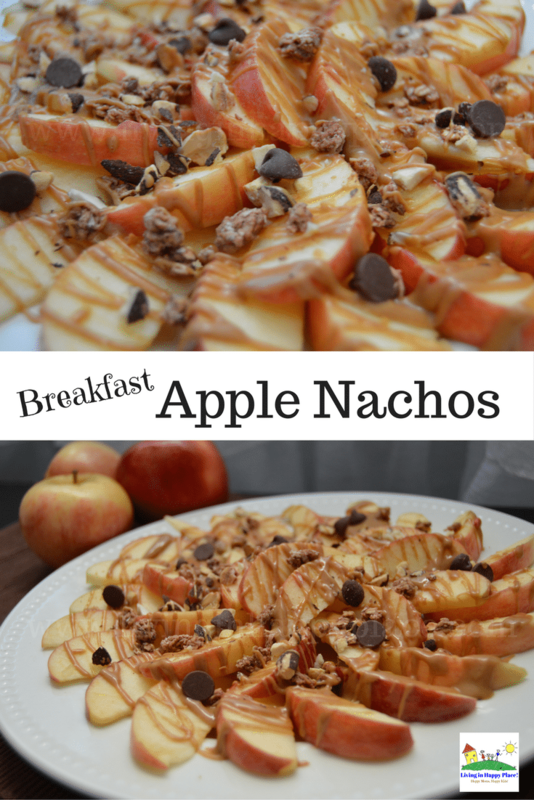 I came up with this combo for breakfast apple nachos to include some of my morning favorites. It is easy to make, no-bake, and large enough to share. It also makes a great snack or even a healthy dessert! This breakfast recipe is kind of a middle ground between a hearty man breakfast and a Nutra-Grain Bar. You have your fruit, your protein, and a little sugar to keep you satisfied. Even the kids will love this alternative to the boring old breakfast options. No one wants to run to the bus with a cold waffle in one hand. Core washed apple and cut into slices. Arrange on a plate. Spoon 2 tablespoons of peanut butter into a small bowl and heat in the microwave for 20-30 seconds. Remove and stir (caution- it will be hot!). Sprinkle granola and crushed nuts over the apples. I used Cocoa Almonds and smashed them up but you can use any type of nut. 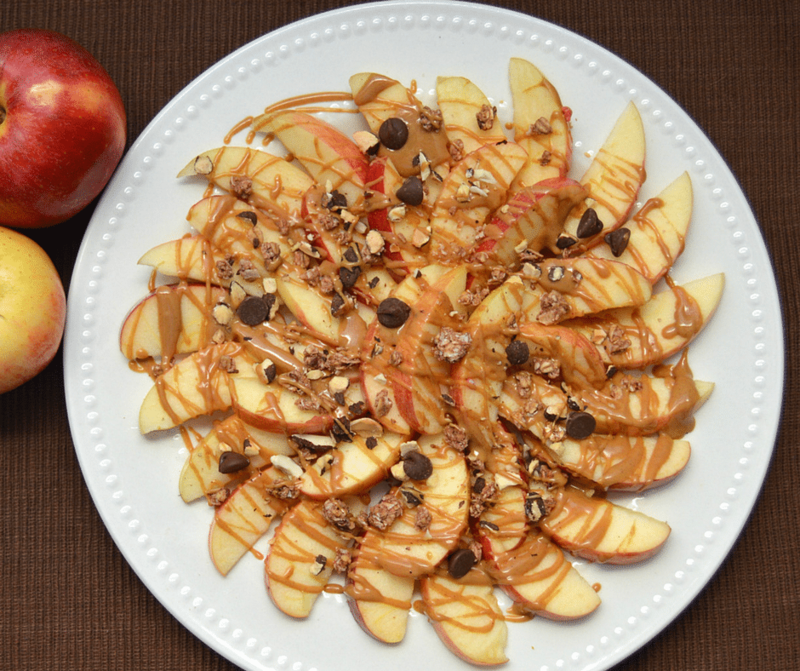 Using a spoon, drizzle the warm peanut butter over the apples and toppings. Use as much or as little as you like. I love this recipe for so many reasons. I feel like I am eating a fancy dish which really comes down to apples and peanut butter (the same thing I feed my toddler for her snack). Switch it up by drizzling chocolate or hazelnut spread in addition to (or in place of) the peanut butter. You could also add dried cranberries/blueberries or fresh fruit like banana or strawberry slices. Now I’m hungry again… Share this with someone who is always looking for a healthy meal or snack! 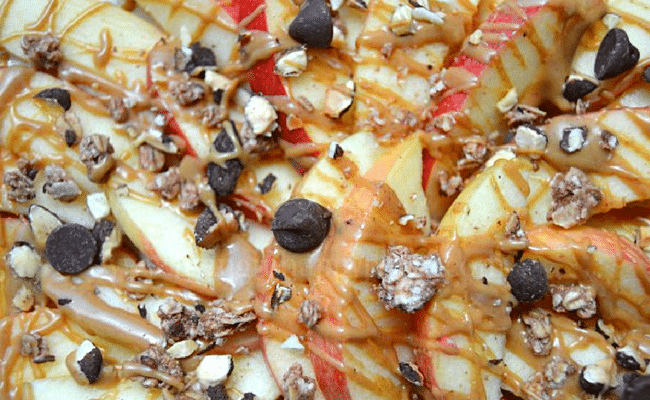 What do you think: Are these apple nachos better for breakfast or dessert? This looks really good and fun! My daughter can’t have nuts and granola because of her braces so I thought about serving it with brown sugar cinnamon instant oatmeal for a “dipping sauce” to help make it hearty!